Sriz Beauty Blog: Energize Your Life with a #MaxFreshMove!!! Even though I’m unwilling to attend the college Festival along with my sister last week, but somehow she forced me to come to her college for the Festival. I went there with disinterest and there my sister introduced me to her friends and I find myself in a position where I could not go back to my home alone as it is far away from that place so I don’t have any other option but to sit there uncomfortably. When we went to a place unwillingly and it appears to us whatever happens there it will end up boring to us and nothing had changed for me even the program started and the principle of the college started the festival with a long, boring speech about the college, staff, courses offered and finally about himself. I was too tired after hearing his speech and even the college students felt bored and I thought the best way to overcome this boredom is to play games in my mobile.so I took my mobile out and held my head down and just started playing the game with so much concentration that I lose track of what's happening on the stage. Suddenly, I heard some music and someone singing my favorite song Dum Maro Dum. Then I Just lifted my head to check what was exactly happening and I was surprised to see, none other than “Anushka Manchanda”- an Indian singer, model, a member of the Indian Pop Girl group Viva, singing in Live. Her voice is simple magical and terrific, not only her voice but she herself was damn hot that I could not even take my eyes off her. After dum maro dum, there was her next number “Dance Basanti” and the list continued. The entire atmosphere in the college was completely refreshed and energized. To add much more energy to the environment, Allu Arjun entered and started dancing to the Anushka Manchanda’s song. Both their combination worked very well and it is like an icing on a cake for all of us. I couldn’t believe what I’m seeing in front of my eyes as I went into different world altogether seeing both of them performing in live. I am privileged to be a part of that great Festival and thanked my sister for making this happen. I thoroughly enjoyed the whole event with much more energy. 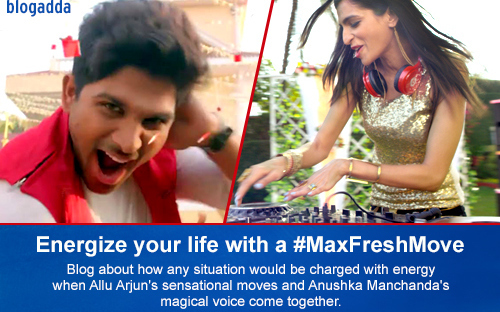 Then I came to know how Music and Dance go in hand to hand and help us to energize our life with #MaxFreshMove!!! Labels: #Maxfreshmove, bavity, blog adda, blogadda, blogadda activity, Energize Your Life with a #MaxFreshMove!! !